You can find step-by-step guides below that will help you move your site to WordPress.com, move to a self-hosted WordPress site, move between Sites at Penn State blogs, transfer your site ownership to another user, and redirect visitors to your new site. 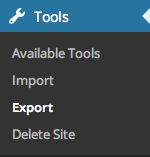 Go to Tools→Export in your Dashboard to download an XML file of your site’s content. This format, which we call WordPress eXtended RSS or WXR, will contain your posts, pages, comments, categories, and tags. Note: The export will not include the theme, customizations, or plugins. Themes and plugins are licensed and cannot be transferred outside of Penn State. You can, however, purchase the license(s) to the themes and plugins you prefer to upload to your new WordPress blog elsewhere. If you would like to move your Sites at Penn State WordPress site over to WordPress.com, you can follow the instructions on the WordPress.com’s support pages. WordPress.com’s guide to moving your site will, for the most part, explain how to move your Sites at Penn State site to your own self-hosted WordPress installation. The best way to move your site from one URL to a new URL is to request for a Site Clone to be performed. After you’ve cloned your site to its new location, you can set the privacy on your old site to be hidden (so you can keep a copy or essentially archive it) or you may delete your site permanently. Please refer to the Transferring Ownership documentation. If you are moving your site to a new location either on the Sites at Penn State network or to another site hosted elsewhere, you can use the Safe Redirect Manager plugin (external link) to forward your old site’s URL to its new URL. To delete your site from Sites at Penn State, please follow the instructions on our Delete Site page.